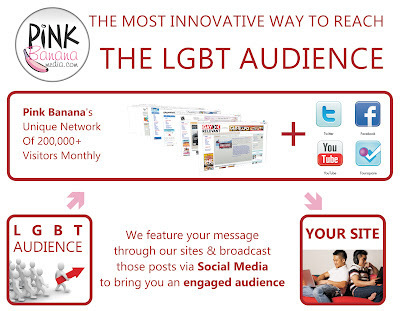 Our marketing programs begin in the form of a marketing piece very similar to an e-mail campaign, but designed to be both optimized for social media, as well as for editorial coverage from other LGBT publications, websites and blogs. Pulling from the membership and newsletter distribution of our network of LGBT websites, including GayMonde.com, GayRelevant.com and PinkBananaWorld.com, we have an opt-in e-mail database of 175,000 recipients, along with zip/postal code information, gender and more. 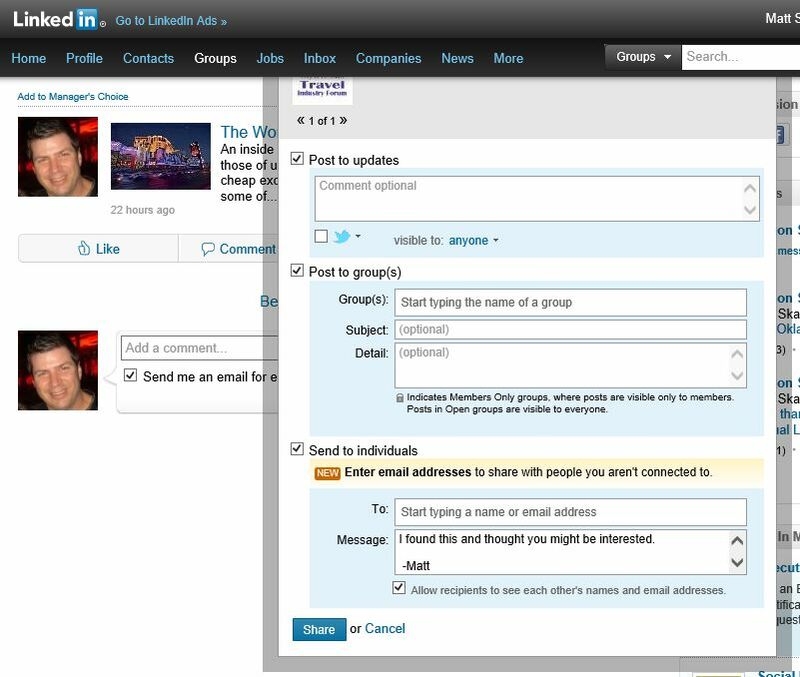 This marketing piece is distributed to that list, along with the social media sharing opportunities built in to the top of each one. 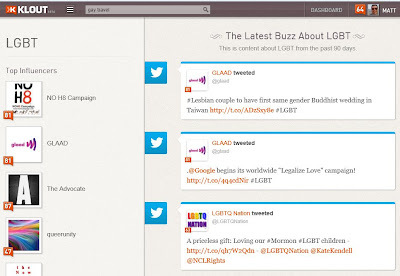 Working from within our network of websites (reaching over 200,000 unique visitors per month), as outlined above, as well as including some of our partner websites including LesbianNews.com and more, we're able to broadcast this marketing piece far and wide, merging the marketing piece into the editorial coverage of each website. This marketing piece is also promoted top-of-fold on our network of websites as well. Each editorial posting has been optimized for distribution on all social media networks, including Facebook, LinkedIn, Google Plus and Twitter. 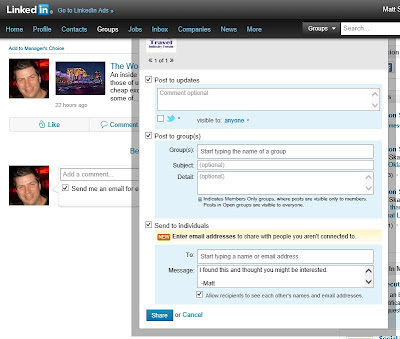 It has also been optimized for quick and easy e-mail sharing as well. This program is designed from the ground up to be optimized for social media distribution. The marketing piece is designed so that the thumbnail images, as well as the descriptive text, are optimized and controlled for the best social media presentation every time someone shares, comments on, retweets or likes this piece. The technology takes advantage of the latest in Open Graph protocols, technology used for social media optimization, similar in scope to search engine optimization. 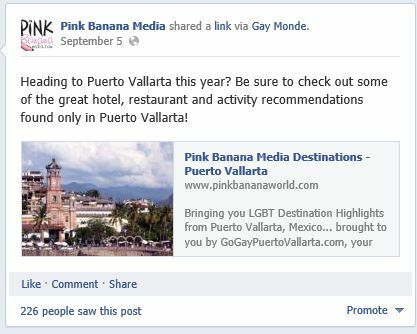 This marketing piece is promoted on all relevant LGBT Facebook fan pages, business pages and groups specific to the targeted industry, i.e., travel, business, health, etc. 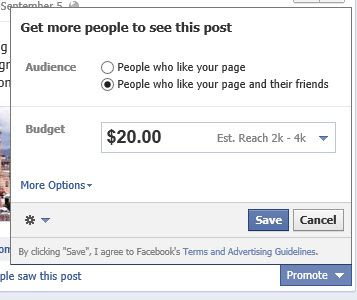 Each promotion can be individually tracked, with information on how many people saw the post, shared the post and interacted with the post, including interactions from "friends of friends". Each posting from a business/fan page that is managed by Pink Banana Media can be individually measured and evaluated on its performance. 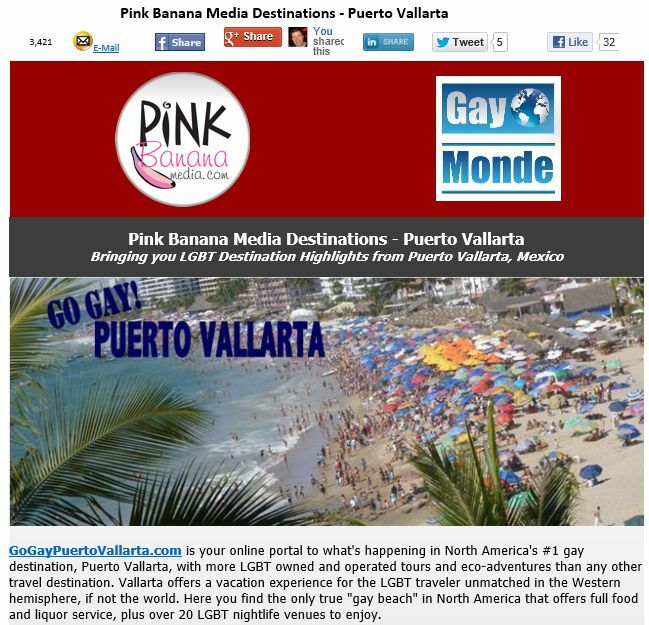 In addition, we do paid promotions of these postings, ensuring that the exposure and coverage goes from several hundred viewings by individual LGBT members to several thousand viewings. 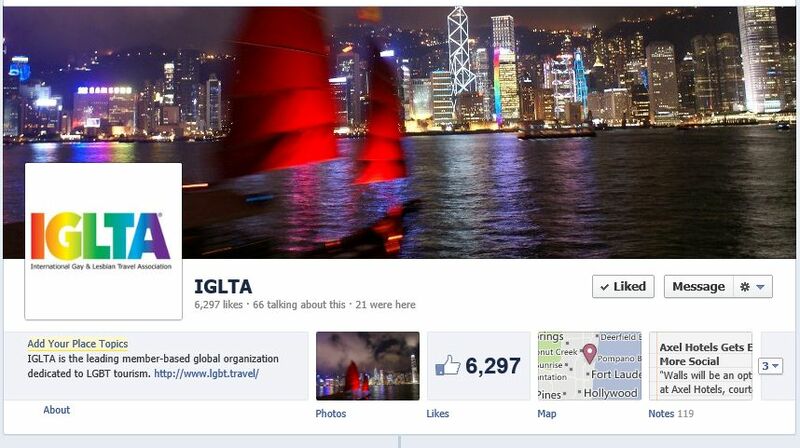 Lastly, this marketing piece is promoted in relevant Facebook groups, with some having several thousand members each. 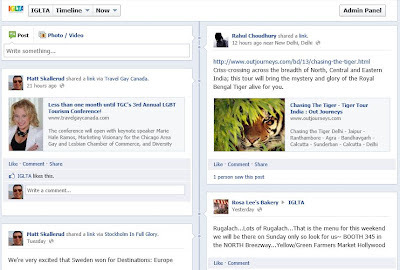 Relevant Facebook fan pages can also be promoted on, albeit in a less prominent fashion. 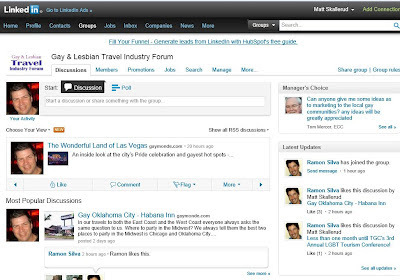 Promoting this marketing piece to relevant LinkedIn groups, sometimes having several thousand members, is also a strong part of this marketing program's outreach. 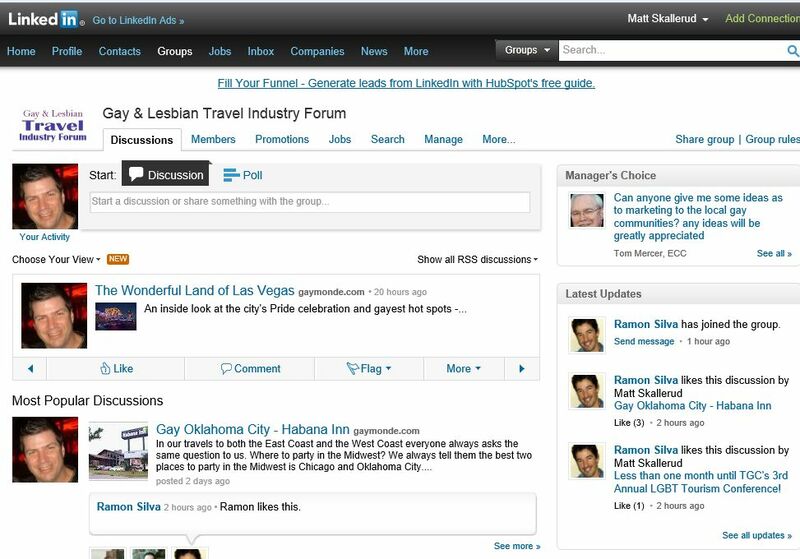 LinkedIn also makes it quite easy to share these postings with other relevant groups, as well as individuals (key influencers) within a specific industry. 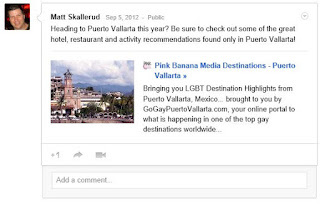 Google Plus, a bit later to the social media game, is also becoming more and more relevant. 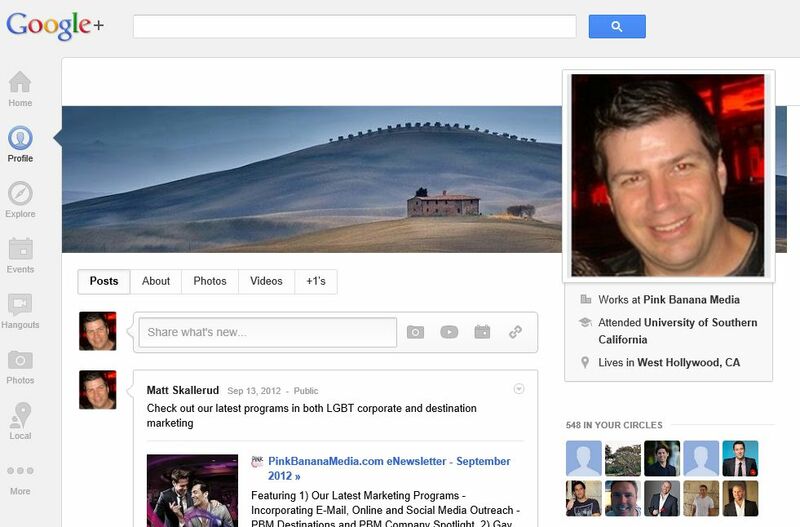 Due to their market share and overall dominance in search, Google Plus has made it so that any posting done on their site can be readily shared with others within specific industries (aka "circles") who the person posting is connected to. 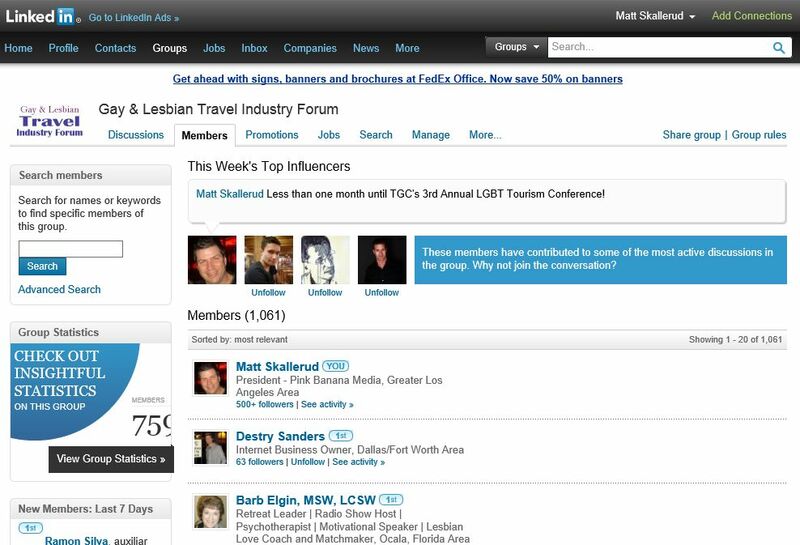 Many Google Plus users have several hundred connections/friends, with individuals in their specific "LGBT business", "LGBT travel", etc. 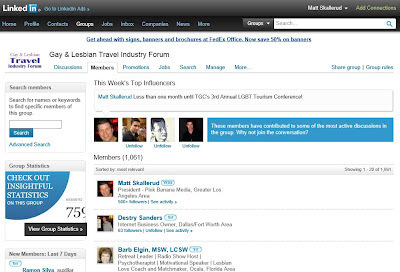 circles also reaching several hundred users. 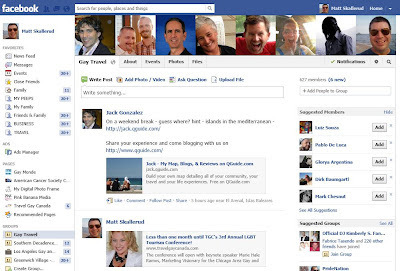 In addition, every time someone "likes" or "shares" a posting on Google Plus (known as "+1" in the Google Plus world), these interactions improve the search engine positioning of the posting, as well as show individual users of Google what their friends have liked or shared as well. The concept is that search results are considered more relevant when they show what a person's friends are interested in as well. 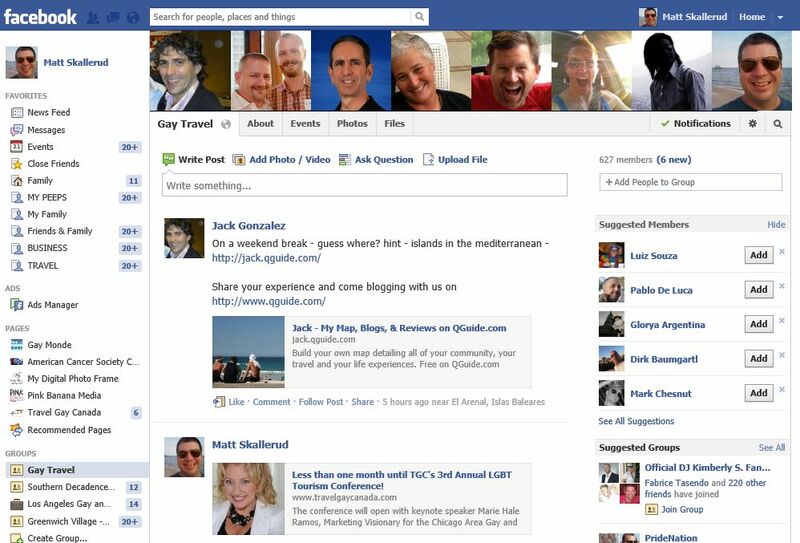 On a side note, Bing.com (Microsoft's search engine) is also getting in on the "social media merged with search results" game, integrating with Facebook as seen below. 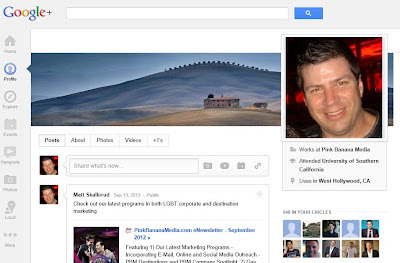 Every aspect of this marketing program is designed to be optimized for Google and Bing, as well as promoted on Google Plus. 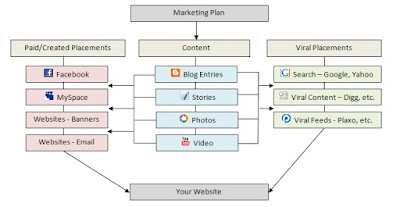 This step was saved for last, as it's not only an important aspect of this overall marketing program... it's also the one that ties in to all of the marketing activities outlined above. 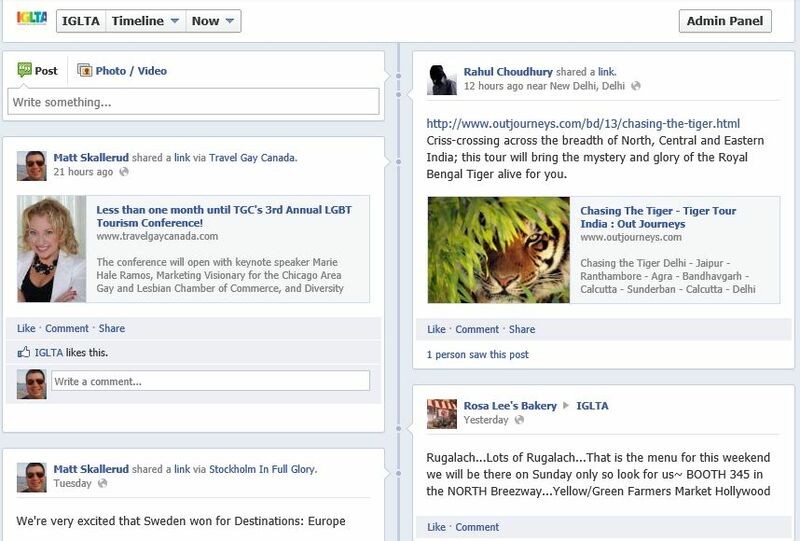 Every time we post on Facebook or LinkedIn, the posting simultaneously (and automatically) posts on Twitter. 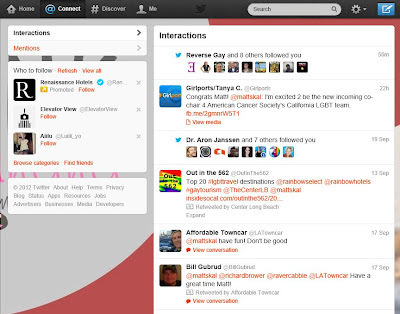 The e-mail distribution is optimized for distribution by individual recipients onto Twitter, as well as the editorial coverage in each website. Twitter is unique in that it is used in such a wide variety of ways... some people pay attention to the postings of those they follow, while others pay closer attention to what anyone is saying based upon doing key word searches on a particular industry, such as "gay travel" or "gay hotel Miami". 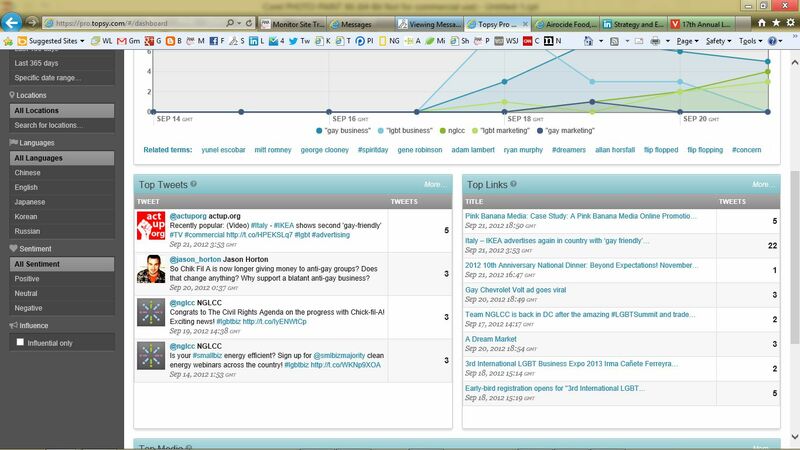 No matter how it is utilized, most social media monitoring tools use Twitter as a key component in order to determine how "relevant" a company's posting is, with the relevance increasing the more individual users share other Tweets, known as Retweeting. 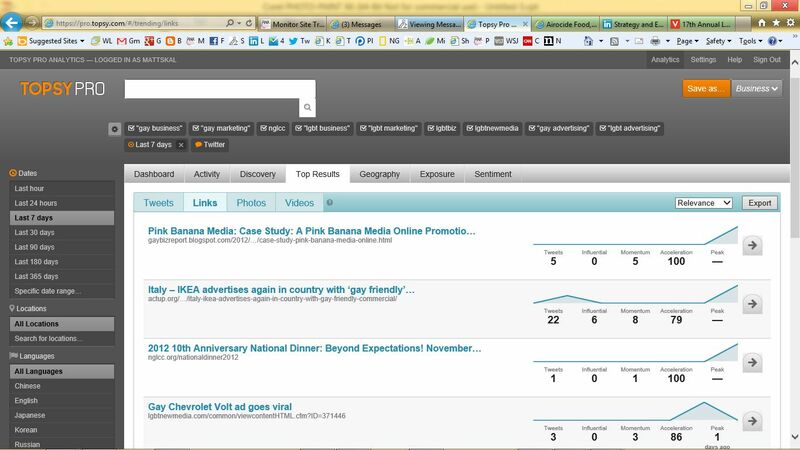 The greater the relevance, the greater that postings chances are of being seen by others. It's becoming a science unto itself. A good segue between Twitter and Trends/Influencers is to show a few examples of a social media analytics program by Topsy.com. 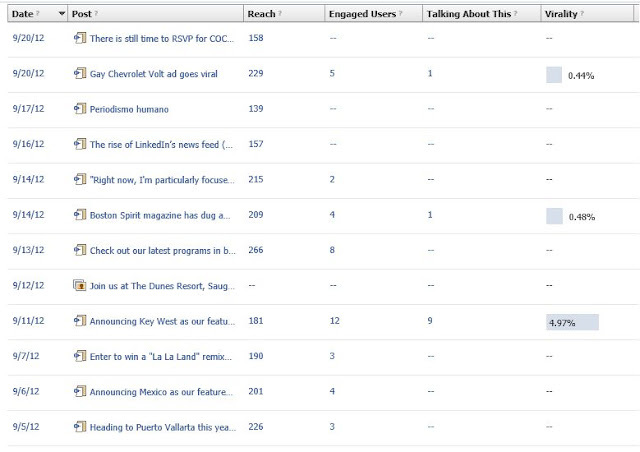 There are quite a few programs on the market, some much more advanced than Topsy, some simpler... some that measure social media for specific industries and some that do a more detailed analysis of all social media, including Facebook, LinkedIn, Google Plus and Twitter. The following 6 screen shots should give you a pretty good idea of the analysis that is being currently done on Tweets related to your specific field, in this example "gay business". 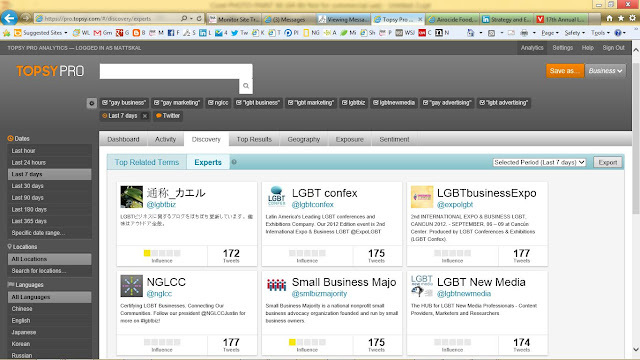 We have set up Topsy Pro to monitor "Gay Business", "Gay Marketing", "NGLCC", "LGBT Business", "LGBT Marketing", "LGBTBiz", "Gay Advertising" and "LGBT Advertising". 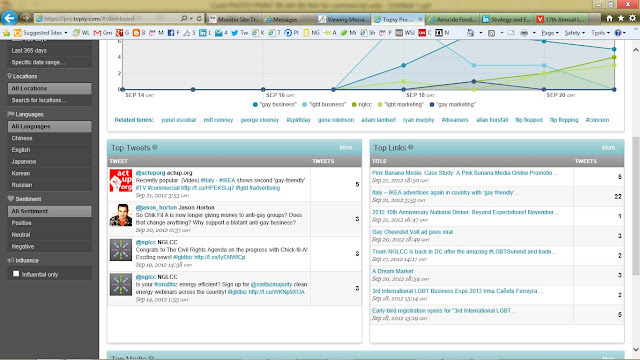 It summarizes the results daily and displays what is being talked about most. 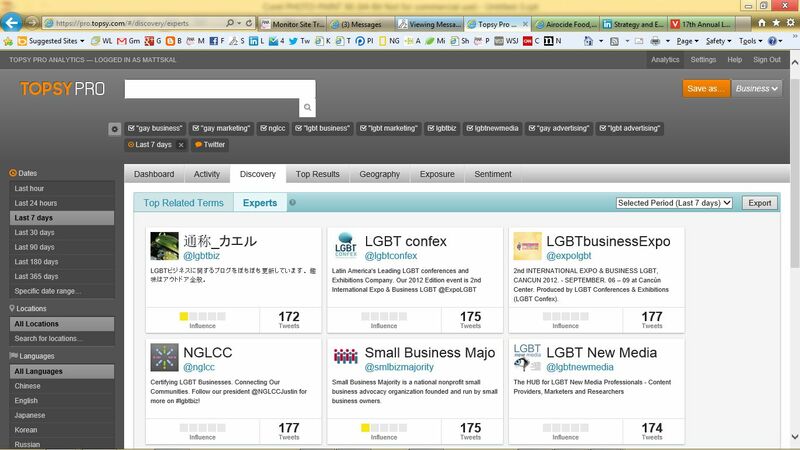 It also discovers the hottest trends in "gay business", as well as WHO is the most influential in "gay business" that day. 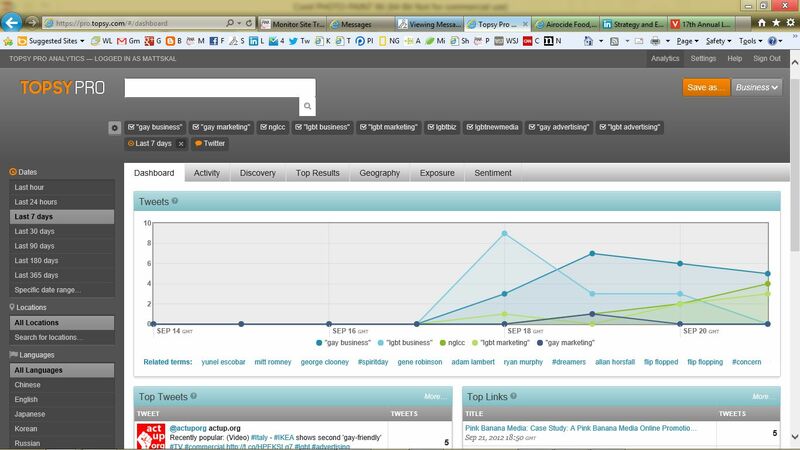 Lastly, it gives 4 values to the most prominent trending links posted - Influential, Momentum, Acceleration and Peak (when did this posting reach its maximum audience). To describe each of these in detail would be a chapter unto itself... it's well worth researching at Topsy.com. We utilize these and other tools to monitor our clients' social media performance on a daily basis. For most clients, there are key individuals talking, sharing and discussing topics relevant to their industry. 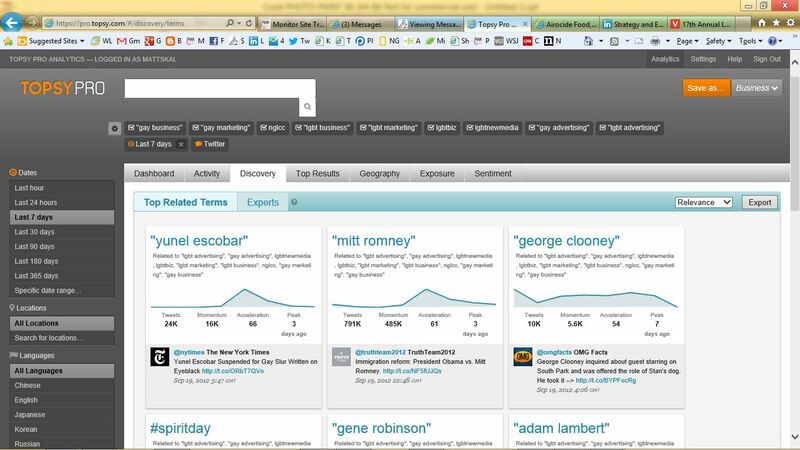 These individuals are easier to identify nowadays, thanks to sites such as Klout.com. 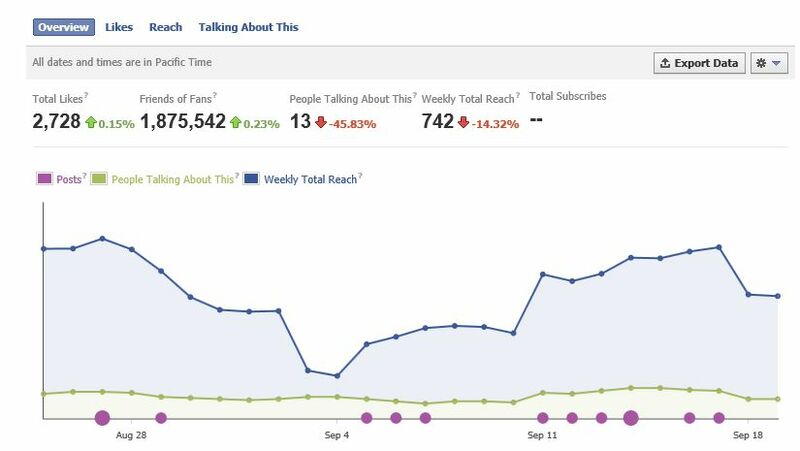 We utilize these influencers when helping to get the word out about this marketing program as well. This marketing program is also designed and optimized for search engine placement, including utilizing the latest in Meta Tag technology. 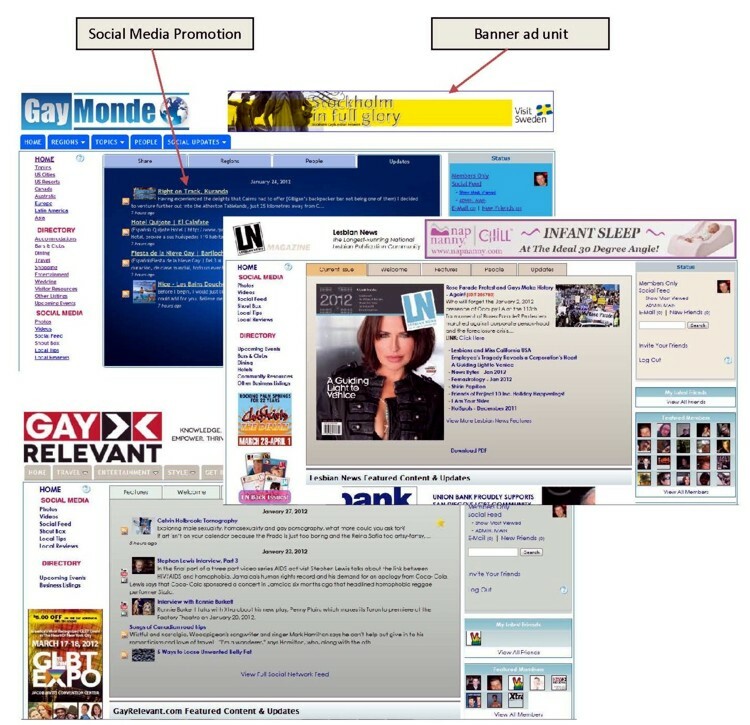 These marketing pieces remain online for a minimum of one year, ensuring that they work for the companies being promoted long after the initial marketing aspects of this program are completed. 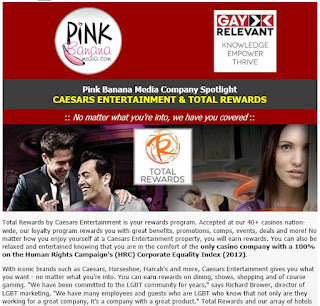 If this type of marketing program makes sense... if you want to see your company on the cutting edge when it comes to utilizing the latest in technology and applying it to your marketing outreach in today's competitive business environment, let Pink Banana Media, with a 17 year history in LGBT online marketing, help you out. 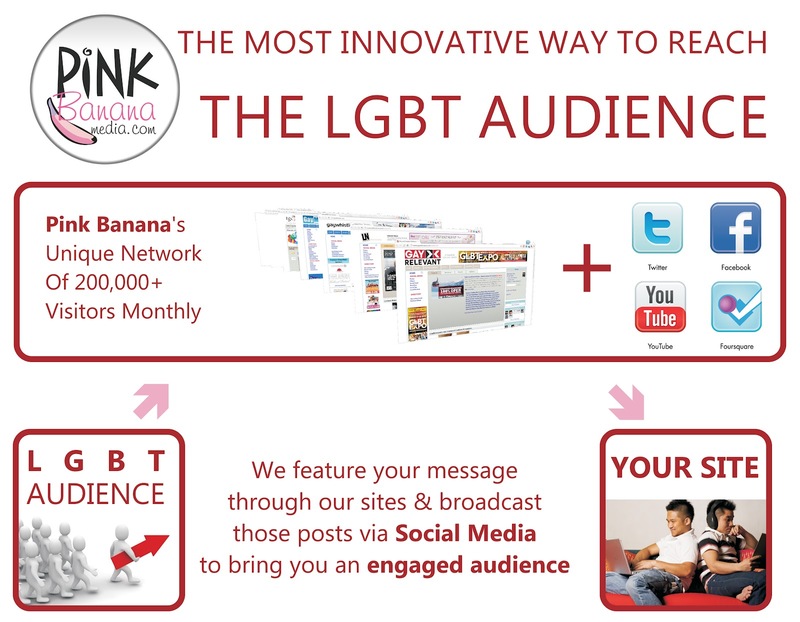 We're a company that continually monitors new technology and understands the key players of the LGBT marketplace... we're a company that can lead you and your product to success!